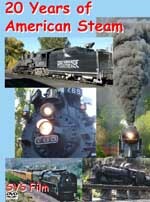 This listing is maintained for personal use and is not intended to be a complete diary of steam train events in the USA and Canada. SVS Film will not be responsible for any errors or omissions, nor will be responsible for any expenses or other costs incurred as a result of the information printed here. All schedules are subject to change without notice. PLEASE DO NOT USE THIS SCHEDULE TO MAKE TRAVEL PLANS WITHOUT CHECKING WITH THE RAILROAD/OPERATOR FIRST. Some entries are shown as To be confirmed . This indicates that early information has been learnt, but has not been verified by the proposed operating organisation!! 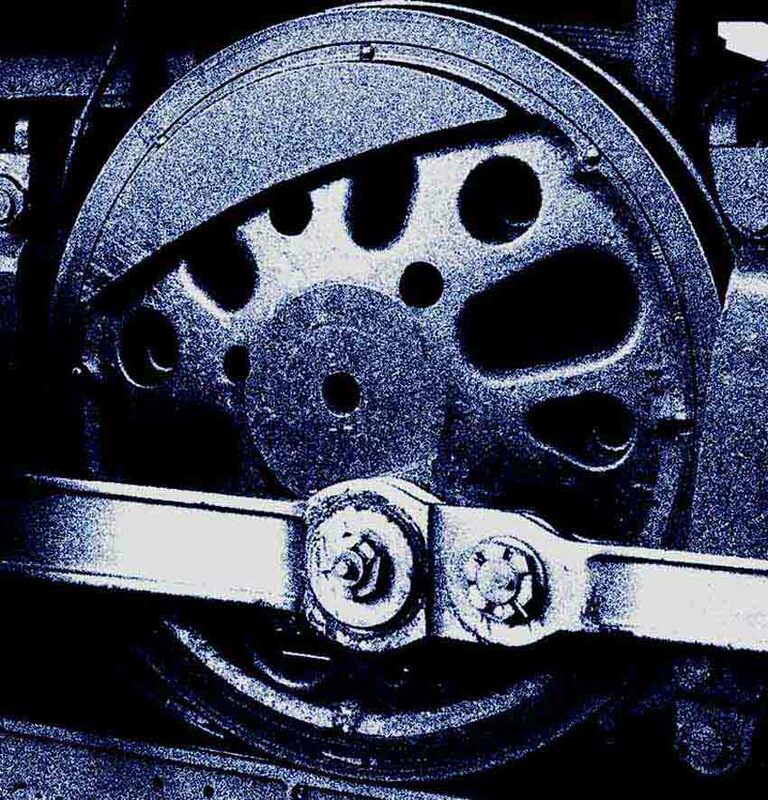 We would welcome any comments, corrections or updates by email ESPECIALLY if you are a tourist railroad, or operator of a preserved steam locomotive! NKP 2-8-4 #765 in action on the Cuyahoga Valley Scenic Railroad, September 2017. 'Photo of the Week' picture contributions always considered for possible inclusion - copyright credit given - submit .jpg file by email to SVS Film. April 6 and 20 - Williams AZ. Grand Canyon 2-8-2 #4960 or 2-8-0 #29 due to operate the round trip to the Canyon. April 6 and 20 - Chattanooga TN: Tennessee Valley Railway Museum trip to Summerville GA with steam (4501 and/or 630). April 27 - May 9 - Cheyenne WY. UP 4-8-4 #844 leaves for Ogden April 27. Cheyenne to Rock Springs April 27. Rock Springs to Ogden April 28. On display Ogden Union Station April 29 - May 4. May 4 - Williams AZ. Grand Canyon 2-8-2 #4960 or 2-8-0 #29 due to operate the round trip to the Canyon. May 4 - Chattanooga TN: Tennessee Valley Railway Museum trip to Summerville GA with steam (4501 and/or 630). April 27 - May 9 - Ogden UT. UP 4-8-4 #844 on display Ogden Union Station April 29 - May 4. Cheyenne to Rock Springs April 27. Rock Springs to Ogden April 28. On display Ogden Union Station April 29 - May 4 and May 6 - 9. May 4 - 9 - Cheyenne WY. UP 4-8-8-4 #4014 from Cheyenne to Rawlins May 4. Rawlins to Rock Springs May 5. Rock Springs to Evanston May 6. Evanston to Ogden May 8. Celebratory event Ogden Union Station May 9. May 12 - 19 - Ogden UT. UP 4-8-8-4 #4014 double-head with UP 4-8-4 #844. Ogden Union Station on display May 10 and 11. Ogden to Evanston May 12. Evanston to Rock Springs May 13. Rock Springs on display May 14 - 15. Rock Springs to Rawlins May 16. Rawlins to Laramie May 17. Laramie to Cheyenne May 19. May 12 - Ogden UT. One way excursion from Ogden to Evanston double-headed with 844 and 4014. Full details to be announced. June 1 - Williams AZ. Grand Canyon 2-8-2 #4960 or 2-8-0 #29 due to operate the round trip to the Canyon. June 1 - Chattanooga TN: Tennessee Valley Railway Museum trip to Summerville GA with steam (4501 and/or 630). June 22 and 23 - Minneapolis MI: MILW 4-8-4 #261 heads round trip excursions to Glencoe on Saturday and towards Winthrop on Sunday. June 29 - Menlo Iowa: QJ 2-10-2 heading four trips east and west from town (west of Des Moines). July 4 - Cumberland MD. To be confirmed Western Maryland Scenic Railroad possible excursions with newly restored C&O 2-6-6-2 #1309. July 4 and 20 - Chattanooga TN: Tennessee Valley Railway Museum trip to Summerville GA with steam (4501 and/or 630). July 6 - Williams AZ. Grand Canyon 2-8-2 #4960 or 2-8-0 #29 due to operate the round trip to the Canyon. August 3 - Williams AZ. Grand Canyon 2-8-2 #4960 or 2-8-0 #29 due to operate the round trip to the Canyon. August 3 and 17 - Chattanooga TN: Tennessee Valley Railway Museum trip to Summerville GA with steam (4501 and/or 630). September 6 - 8 - Durbin WV. Rail Heritage Weekend on Durbin & Greenbrier Valley/Cass three day steam event including newly restored Middle Fork Climax Number 9, Heisler and Shays. September 7 and 21 - Williams AZ. Grand Canyon 2-8-2 #4960 or 2-8-0 #29 due to operate the round trip to the Canyon. September 14 and 28 - Chattanooga TN: Tennessee Valley Railway Museum trip to Summerville GA with steam (4501 and/or 630). 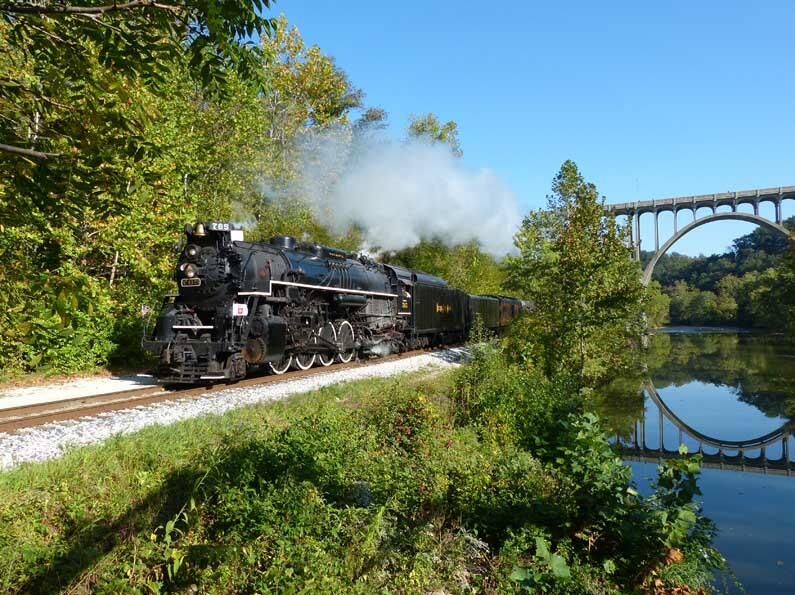 September 20, 21, 22 and 27, 28, 29 - Akron and Independence OH: Nickel Plate 2-8-4 #765 will operate 'Steam in the Valley' excursions along the Cuyahoga Valley Scenic Railroad. Details to follow. September 28, 29 - Strasburg PA: N&W #611 visits the Strasburg Railroad. Special events. October 4 - 6 - Strasburg PA: N&W #611 visits the Strasburg Railroad. Special events. October 5 - Williams AZ. Grand Canyon 2-8-2 #4960 or 2-8-0 #29 due to operate the round trip to the Canyon. October 5, 12, 19, 20, 26 and 27 - Chattanooga TN: Tennessee Valley Railway Museum trip to Summerville GA with steam (4501 and/or 630). October 12 - 14, 19 - 20 and 26 - 27 - Strasburg PA: N&W #611 visits the Strasburg Railroad. Special events. November 2, 9 and 10 - Chattanooga TN: Tennessee Valley Railway Museum trip to Summerville GA with steam (4501 and/or 630).